Music fanzines with free gift! Recently I have acquired a couple of zines from the UK which have happily also come with CD-Rs of music that I love. Ricochet! Ricochet! 8 features the sleazy Sam & Lindsay on the front cover, and its contents includes “How Gay Is Camberwell?” (which I was excited to realise I actually understand, having lived in London for a year now, though don’t know how this piece would translate to my friends in Auckland, though Colette pointed out to me that every city has a Camberwell. Too true…), also Zine Reviews and other stuff that made me laugh heaps – this is one of my favourite zines to read when I’m feeling not so glad, it always cheers me up. 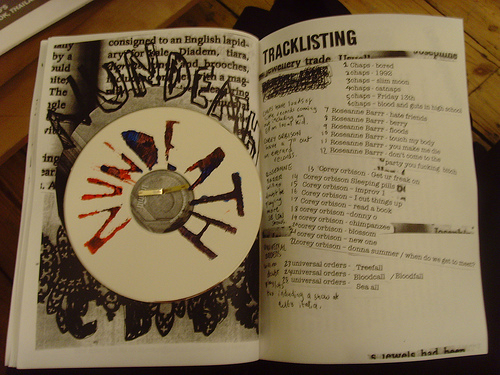 But, the greatest bit is the CD, tucked away inside and stuck to the page with one of those butterfly, hingey clip thingys…Featured bands are: Chaps, Roseanne Barrr, Corey Orbison & Universal Orders, recorded during their NUNDEATH show, aka, I assume, a fun party at Colly’s house. I’m pretty sure I’ve seen all these bands live, at least once, and I like them all, especially Roseanne Barrr, who are a boy/girl DIY punk outfit. The thing is, most bands I really like, particularly the newish kinda shambolically put together ones, don’t have many recordings out there in the world, so it was extra awesome to have a copy of these guys playing live, particularly with a commentary of the show to give it all context. Anyway, Richochet! Ricochet! is a zine put out by Patrick & Colette and you can check out their distro (by the same name) here, and order a copy of Ricochet! Ricochet! 8!! The second such zine to fall into my possession is an older one, and I’m not entirely sure who it’s put out by, but I’m assuming it’s connected with Newcastle DIY record label Slampt, but if you know better, please correct me if I’m wrong. Anyways, the name of the zine is North East Under: an unauthorised glance through a personal archive of North East underground music 1992-2006. A pretty plain cover, to be sure, but I like that, cos it kind of gives the zine a serious dorkiness, which pleases. 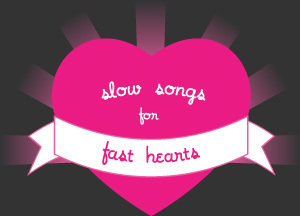 Basically, this zine (which contains a CD-R too, obv), is a sampler of said music, and includes bands such as Pussycat Trash, Avocado Baby, Kenickie, Milky Wimpshake, Red Monkey and lots of others (20 songs in all). Each band’s song comes with a short para of info, so you can read along as you listen to the bands, and get a thoroughly good education in this genre. The recordings are as good as they would have been on these band’s releases, as they have all been copied from those original CDs, so what you have is essentially a mixtape, a non-profit bootleg, which someone has made solely cos they love the bands on it and want to share. I actually have no idea where you would get hold of this zine generally, as a friend gave it to me, but perhaps if you go to the Slampt page you can ask?